Visitors to our stand (booth) at tradeshows can interact with a demonstration of Greengage’s new intelligent platform for livestock farming. The launch of a new suite of sensors, that seamlessly integrate with our ALIS lighting system, marks the start of a new chapter for the Scotland-based agri-tech business. Greengage is committed to solving the increasing challenges in global food production by applying the science of light, research and patented technology to a new range of innovative LED lights, sensors, web app and data analytics. Sensors clip on to the same ALIS (Agricultural Lighting Induction System) induction power cable used for lighting in livestock sheds, creating an aerial network of lights and seven sensors looking down on the animals; monitoring critical parameters for welfare, productivity and the environment. low energy consumption, for example, ALIS Barn Lamp consumes just 10Watts. Summary of our new LED and patented inductively powered lighting line-up. ALIS Barn Lamps (wide and narrow beam) has a rated lamp life of 100,000 hours and provides optimum lighting conditions for farmers’ flocks. ALIS Blue Lamps Creates calming conditions in poultry sheds for the catching phase. ALIS Tube Lamps deliver optimum lighting conditions in layer systems using induction technology – keeping the power supply front of house for safety. 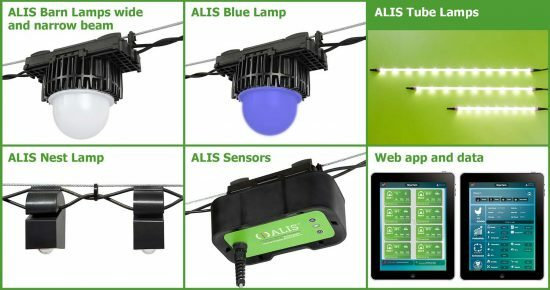 ALIS Nest Lamp provides poultry farmers with more control over their flocks, such as directing birds towards nests and reducing eggs on the floor. Contact Greengage on 0131 650 8851 to find out how our ALIS platform can improve productivity and animal welfare on your farm or request a presentation below.